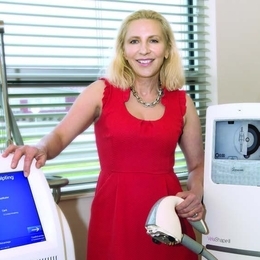 Warmuth Institute of Dermatology offers several methods of non-invasive body contouring treatments, with little-to-no downtime—just in time for summer. Today, there are a lot of misconceptions surrounding aesthetic non-invasive procedures, otherwise known as body contouring. Whether it’s CoolSculpting or another non-invasive modality, Warmuth Institute of Dermatology’s Dr. Ingrid P. Warmuth and Lauren Hartman, a board-certified physician assistant, are quick to quash any misconceptions or fears a patient may have and offer a safe space to learn about the options and determine which is best suited for their body type. The best outcomes are often the result of safe and effective treatments, coupled with a healthy lifestyle. “Among the many benefits of body contouring, perhaps the most valuable are the improved levels of self-esteem seen in a patient following the application of various modalities, as well as motivating a patient to live a more balanced lifestyle,” say Dr. Warmuth and Hartman. “Receiving non-invasive treatments often encourages patients to lead a healthier lifestyle to further improvements and results for their body and mind,” they add. “Each respective treatment gives great results for both men and women in their own right, specifically for those looking for a quick and efficient way to improve their bodies. Those techniques include CoolSculpting, an FDA-cleared, non-invasive, fat-eliminating treatment which rids fat cells through freezing them away, also known as cryotherapy. While it continues to advance and improve, its latest applicators now decrease treatment time, letting patients walk out in a short time and continue their regular activities without downtime. Dual-Sculpting is another option, which enables experts to treat two separate areas at the same time, if need be. There’s also Ultrashape, a treatment that targets fat cells utilizing ultrasound technology (high-frequency soundwaves) through as little as three treatments, and VelaShape III, which targets cellulite and reduces the appearance of dimpling on the skin using radiofrequency technology. Interested patients can receive further analysis on a treatment, along with a complimentary 360- degree consultation at any of Warmuth Institute of Dermatology’s three locations prior to committing to a treatment. When it comes to results, patients can expect to see a change in about 90 days, while Warmuth Institute’s experts follow up within 30 days after the initial treatment. “As has been the case in the past, patients may even feel better in their clothing at this time—along with having more self-confidence—but around the 90-day mark is when the results can truly be appreciated,” note Dr. Warmuth and Hartman.